A friend’s father once told me a story that was very hard to believe, but so are many stories. He was about my age (eight) when he told me the story. He was out playing and riding his bike when he hit something in the road and lost control of his bike. He was also going downhill so he couldn’t just stop. Suddenly a car was in the same lane he was and he thought, this is going to be very bad. He closed his eyes and when he opened them he found himself on the other side of the street and he was back in control of his bike. From this day on, he believed that God sends angels to help us. This book is filled with inspirational stories where God sent somone, or something to intervene and help the situation. I love reading stories like these. You hear stories like this at church and I loved reading them out of this book. Julie, not sure that compiling this book was what she was supposed to do, asked for a sign and she received one. That is one of the interesting things you’ll discover from reading this book. Who is Julie? Julie is an Author and Marketing Consultant. She majored in Psychology and minored in Business. After ten years of marketing and management God called her back to writing. She teaches and attends conferences around the world. To learn more about Julie visit http://www.juliebonnheath.com/. Guess what? This is yet another blog tour that you can win prizes for commenting! 12/1/08. “Angel Talk” with Julie Bonn Heath and Joan Wester Anderson from 6pm-7pm (Pacific Time), a live chat. We will answer your questions about angels (those answers we know anyway) or any other angel topic that you can think of. To chat, go to http://www.julierheath.com/chat.html and click “Enter” (only on December 1, 2008 at scheduled chat time). 12/1/08-Melissa at Melissa’s Cozy Teacup. 12/1/08- Becca at Becca’s Blog from the Left Coast. 12/1/08- Stacie with Knack Parenting, Examiner and Atlanta Parent. 12/3/08-Rhonda Clark with Beach Reads. 12/3/08- Andrea at Chocolate Fingerprints. 12/4/08- Melissa at All Things Girl Magazine. 12/4/08- Diana at Forgetful One. 12/5/08- Sarah at Genesis Moments. 12/5/08- Gem with Sage & Savvy. 12/6/08- Kailani at An Island Review. 12/7/08- Leah with O Momma Reviews. 12/7/08- Stacey at All Because Two People Fell in Love. 12/8/08- Maria at Maria’s Space. 12/9/08- Melissa with From Melissa’s Desk. 12/10/08- Tara with Tara’s View of the World. You can win the book on my post by leaving a comment. You can gain extra entries by entering Queen of the Road – ends December 17th and coming back here leaving a comment. You can enter as many times as you like within the next seven days. All you have to do is leave a comment about angles, Julie, or the book. Don’t forget to leave your e-mail address. Would love to win this inspirational book! This would be a great inspirational gift this season. Your blog is amazing. And now I really want to read that book. This sounds like a great book for the holidays. I would love to give this to my mom. Thanks! This sounds like a wonderful book! Thanks for the entry! I commented on Queen of the Road! I would have loved to hear the discussion on angels, but I didn’t hear about it until after 7 pm. This would be wonderful. Thanks! The story you told was wonderful. That could only have been an angel. I am a big believer in Angels. Both the Heavenly sent and those Humans who are angels to us in time of need. I would love to win this book and read it over and over. Then pass it on to my family. This would make a great gift this Christmas. Thanks. I love inspirational books and this one sounds great!! This book sounds really intresting, I would be blessed if I won. Stopping by on the blog tour – your blog is lovely. Thanks for stopping by my blog tour post for the book. These stories are amazing and some almost “unbelievable” like the one your friend’s dad told when you were 8.
we really enjoyed the book as well! Have you heard of the Angels On Earth magazine? I have been subscribing to it since the beginning in ’95. It has the same kind of stories about true life angels. Simply wonderful! 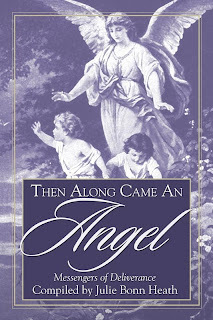 I would love to read this book, i think there are angels seen and not seen…and these stories would be a treat for me, a perfect present! I would love to win this for my dad’s new wife. He has outlived to wonderful women and now he has found a third. I don’t think I’ve ever read a book about angels before and it never occurred to me that I haven’t until your post. I think I need to! Sounds like a very uplifting read. Thanks for the chance to read it. This would be awesome for my mama. Sounds great! Something that I would really love to read right now. I would love to read this book and it would be a great one to pass on to someone who just needs some divine intervention. I entered Queen of the Road, that one sounds hilarious. This book looks like one I’d read over and over again! Would love to own it! Visiting bloggers from the tour. I am sorry to say that I have not read the book, but sure hope to be the winner.